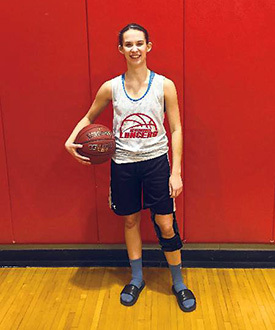 Neshannock High sophomore Ally Zarilla has basketball in her blood. She is a daughter of former New Castle High 1,213-point scorer Jason Zarilla, who played from 1990-1993. Now a member of the Lady Lancers, the WPIAL Class 3A runner-up, the younger Zarilla is hoping to make a name for herself. Zarilla, who comes off the bench, was able to get into a groove in Neshannock’s PIAA first-round playoff win over Everett, knocking down three 3-pointers and scoring 11 points to earn New Castle News Athlete of the Week honors sponsored by Washington Centre Physical Therapy and selected by the News sports staff. The season got off to a delayed start for Zarilla as she missed 13 games while rehabbing from a torn anterior cruciate ligament in her left knee suffered while playing AAU basketball in April 2016. She returned home to see a doctor following the tournament only to find out that she had torn the ligament. Zarilla underwent months of rehabilitation before returning to the court for Neshannock on Jan. 12 against Riverside. Since her return, the sweet-shooting guard is averaging 7.3 points per game, knocking down one 3-pointer per contest and is shooting a county-best 90 percent from the free-throw line. Zarilla is currently the Lady Lancers’ fourth-leading scorer and their top bench contributor. For someone with as little experience on the high school stage as Zarilla has, she exudes confidence.